Actions often have unique behavior when the source or destination is a dashboard. Because a dashboard can contain multiple views, a single filter or highlight action can have broad impact. 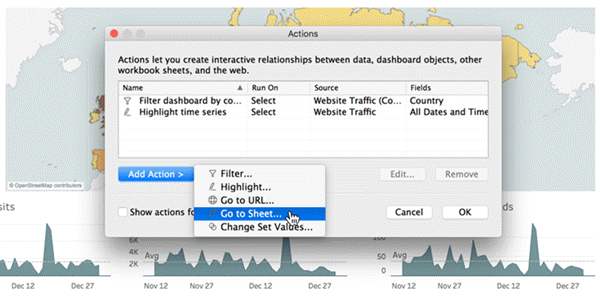 Dashboards can also contain web page objects, which you can target with interactive URL actions. 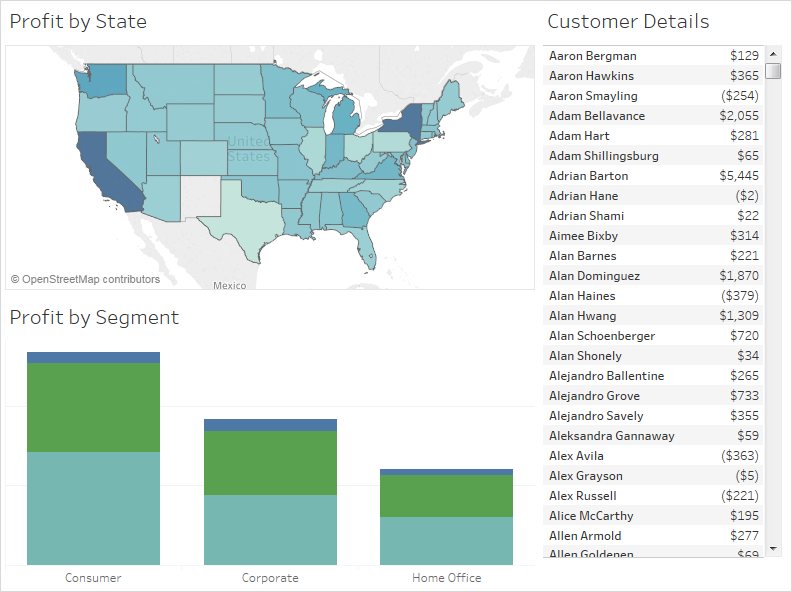 Imagine you have a dashboard that contains three views about profitability: a map, a bar chart, and a table of customer names. You can use a filter action to make one of the views in your dashboard, such as the map, the "master." 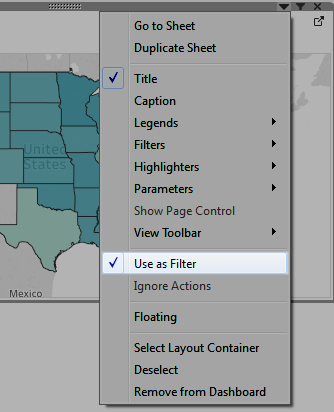 When your users select a region in the map, the data in the other views is filtered so that it relates to just that region. On the dashboard, select the view you want to use as a filter. On the view's shortcut menu, choose Use as Filter. You can perform the same action by clicking the Use as Filter icon . You can also use filter actions to filter the data on a dashboard when the data comes from multiple data sources. 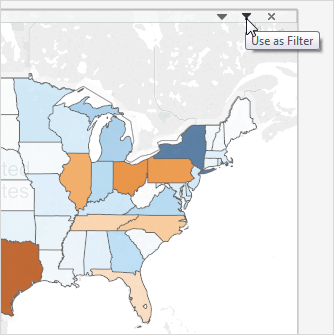 For more information, see Filtering Across Multiple Data Sources Using a Parameter in the Tableau Knowledge Base. For more information about filter actions, see Filter Actions. Similar to how you can use a single view to filter other views in a dashboard, you can also use multiple views as a filter. This is sometimes called having a "multi-master" dashboard. The trick is to not only use the master views as filters, but to also disable their ability to be filtered themselves. Create or open a dashboard that has at least three views. Select the first view that you want to use as a filter (such as a map), and from its shortcut menu, select Use as Filter. Open the same view's shortcut menu again and select Ignore Actions. 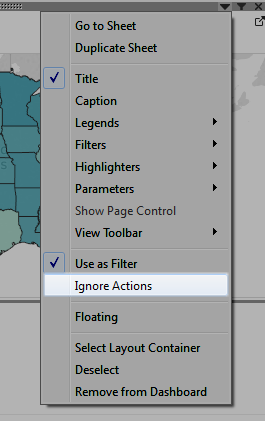 This ensures that other filter actions, including the one you'll create next, will not affect this view. Repeat the steps 2 and 3 for any other views you want to use as a filter. Now, selecting marks in a master view filters data in one or more detail views—all without affecting any other masters. Use the Go to Sheet action to let users quickly navigate to a related visualization—a dashboard, sheet, or story—when they click on a mark or a tooltip menu item in the original view. Note: To simply navigate from one dashboard to another, without requiring users to interact with data, consider using the Button object. From your dashboard, select Dashboard > Actions. 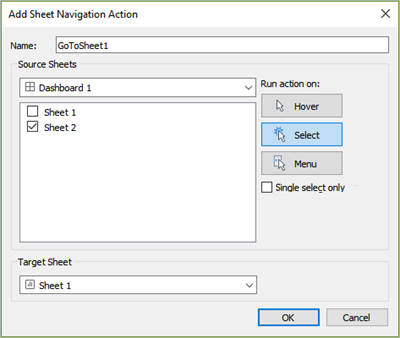 In the Actions dialog box, click Add Action and then select Go to Sheet. Under Source Sheets, select the view that will initiate the action. Specify how people viewing your dashboard will run the action. Select or Menu are the best choices for a navigation action. If you choose Select, consider selecting the Run on single select option so users won't navigate away from the view when exploring multiple marks. For Target Sheet, select the navigation destination that appears when users click marks or tooltip menu items in the source sheet. Then click OK.
To interactively display information from the web inside a dashboard, you can use a URL action with a web page object. For example, you might have a dashboard that shows profits by country. 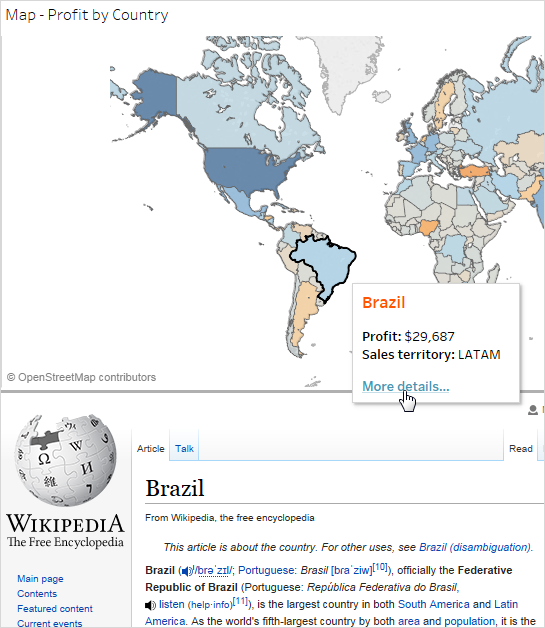 In addition to showing the profit data in your dashboard, you also want to display supplemental information about the countries from a web site. Tip: To easily organize and target multiple web page objects in a dashboard, rename them. Drag a Web Page object onto your dashboard, and enter a URL. In the Actions dialog box, click Add Action and then select Go to URL. Specify a name for the link. If you choose to run the action using a menu, such as a menu option on a tooltip, the name you specify here is what's displayed. Under Source Sheets, select the view or data source that will initiate the action. For example, if you want the action to be initiated when a user clicks a link on a map's tooltip, select the map view. Specify whether people viewing your dashboard will run the action on hover, select, or menu. For details, see Running Actions. Enter the URL, starting with the http:// or https:// prefix, such as http://www.example.com. You can use field values as parameters in your URL. For example, if Country is a field used by a view in your dashboard, you can use <Country> as a parameter in your URL. For details, see URL Actions. For URL Target, select Web Page Object, and select the object you created in step 1. When you launch the action, a web page automatically loads within the dashboard rather than opening a separate browser window.